The family business is an important part of family history. It often explained why a families relocated, stayed where they are, and even why their children chose to stay where they are. 45 year old Matt Bevin knows this better than anyone. His family operated the Bevins Brothers business in East Hampton, CT, where for 180 years they manufactured bells. East Hampton had been known as Bell Town, because at one time, there were as many as 30 bell manufacturers there. But over the years, they went out of business, or moved their operations overseas. However, Bevins Brothers remained the only US-based bell manufacturer. Sleigh bells, church bells, and even the hand bells used by Salvation Army workers are a staple of Christmases in America. The jingling sound of metal ringing against metal adds to the colored lights, the carol singers, and the hot spiced drinks that defines the Red, White, and Blue of Christmas. But in May of 2012, Bevins Brothers went out of business when lightning stuck their factory and burned it to the ground. The last of the American-made bells were gone. "To know that my ancestors for six generations have stood on this exact spot and made bells in Bell Town USA, it means a lot to me," said Bevin. And doesn't the legacy of family persuade one to stand up and rebuild? Knowing that your father, and his father, and his father, have entrusted you with their blood, sweat, and tears, makes you want to put the same effort forward? So now, Bevin and his employees are rebuilding. Having moved into a temporary building, they are refilling an order for 25,000 bells from their biggest client, the Salvation Army. "Made in the USA" will continue to ring. 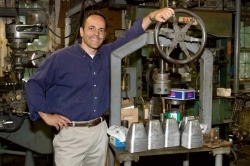 "But they symbolize something much greater", Bevin said of the bells he manufacturers. "They symbolize dreams they symbolize joy, they symbolize memories, they symbolize hope for people." And isn't that what the family business is about, dreams, joy, memories, and hope.? Source: Chip Reid, CBS News, Bevins Brothers Manufacturing.